“A trip to New Mexico…” That sounded great. 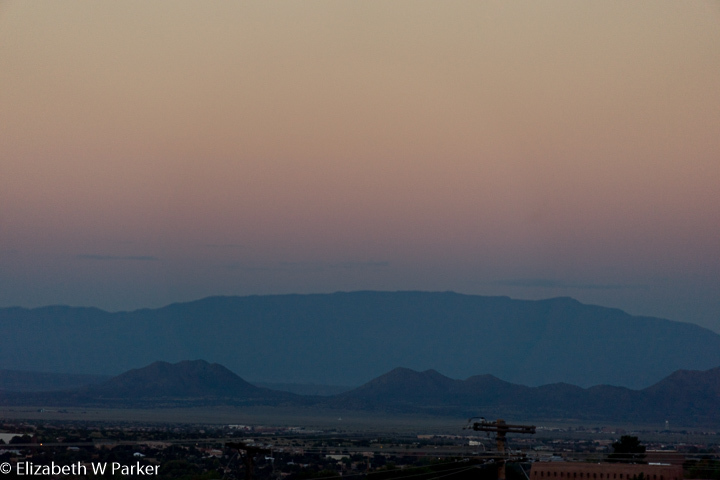 A trip to New Mexico “to take pictures…” That’s better still! And in this case, the trip is to take pictures as part of a reunion of the students of Eddie Soloway, a fantastic photographer we met last summer at Madeleine Island School of Art. It really was, as they say, a no-brainer. I wanted to go and I signed up! Some of the details of the trip, like where we ate and places we visited I have included in a Google Map, embedded in this post, so I am not going to get into that here. Please play with the map, and afterwards tell me if you like that way of presenting information. Names that appear in red, here in the text, have my description included in the map. Click here to see the map. We drove from the Albuquerque airport to Santa Fe. We didn’t take the most scenic drive, but we could get a good idea of the landscape even from I-25. What I saw was a dry, red desert of undulating hills like dunes, dotted with juniper bushes and trees. The buildings were low, mostly one story. It is not an upscale vibe but, definitely, a utilitarian one. Center runs the dormitory and food services for the campus. 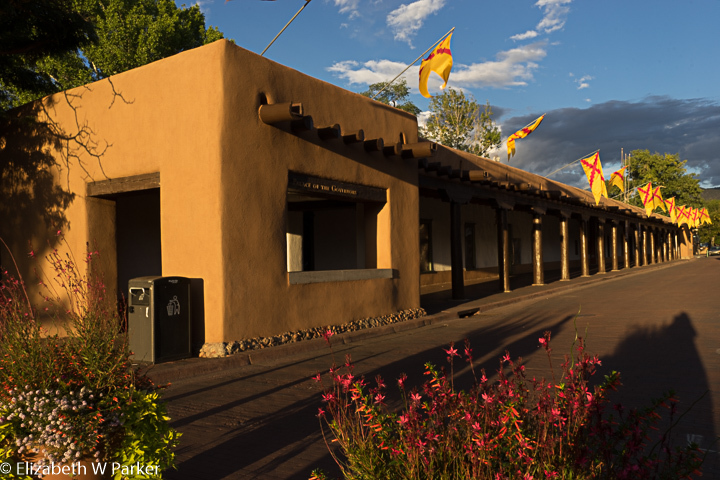 Santa Fe Photography does their workshops here and there may be other groups who rent the facilities, too. While we are here, we are doing an intensive print workshop with Eddie Soloway on Tuesday and on Thursday night we will start a three-day program of conferences, shoots, and social events with other Eddie Soloway alumni. We have two full days between our commitments that we will use to see Santa Fe and the some of the surrounding area. We also have plans to stay three additional days after the reunion to see more, including Taos. 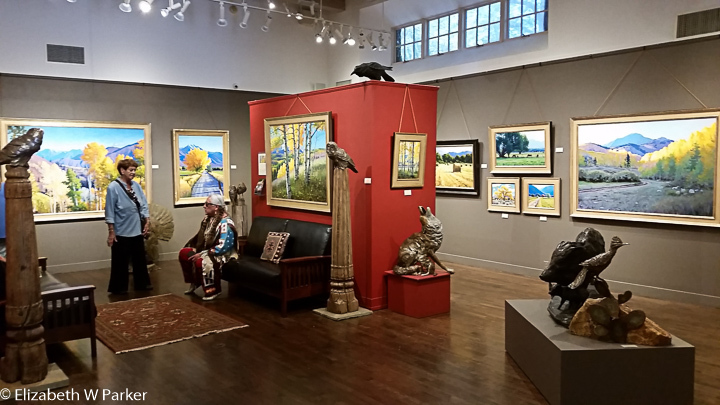 My first impressions of Santa Fe are (you won’t be surprised) that it is a small town and very artsy. Small is relative. The population is over 70K people, which compared to my hometown of Janesville, WI seems large! Coming from San Juan, PR and Milwaukee though, it’s small! The homogeneity of the architecture is one of the charms of this city. If it were so just for tourists, it would get tiresome and tacky, but the historical look of the place is complemented by the unique stores and many, many galleries. You do not get the impression that the architecture is anything but respect for history, of which there is so much more than meets the eye. 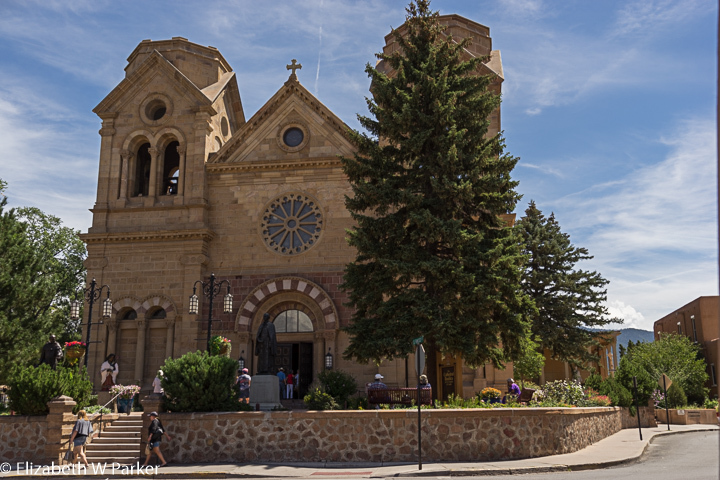 Cathedral Basilica in Santa Fe – This building was the legacy of the archbishop in the book. As I mentioned, our first day was an intensive workshop in creating fine art prints. 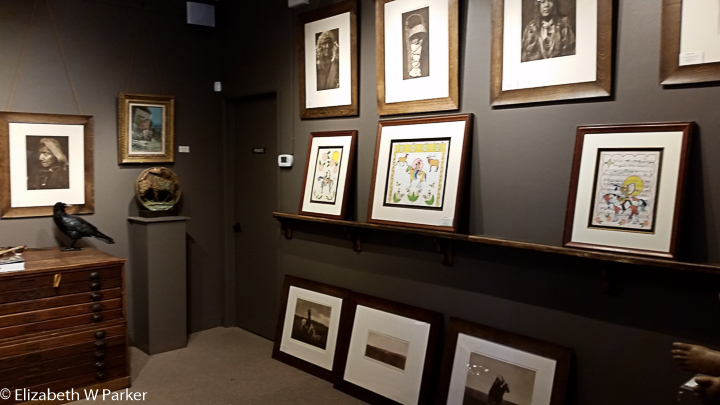 Manitou Gallery – Photos of Edward Curtis above and below, and the work of our Storyteller on the shelf. Day two we were free to do what we want and our choice was to actually visit some of the sites in Santa Fe, but our first stop was at the Manitou Gallery (on Canyon Road) for a talk by photographer and art historian John Boland about Edward Curtis, an early 20th century photographer who documented the native people. He already knew as he prepared his folios of images that this might be the last look anyone would get of our indigenous people and their lives. As a bonus, we also had a short talk and a questions session by a native story-teller in full regalia. He is also an artist, working in the ledger style of the warrior braves. It was interesting, educational and emotional. 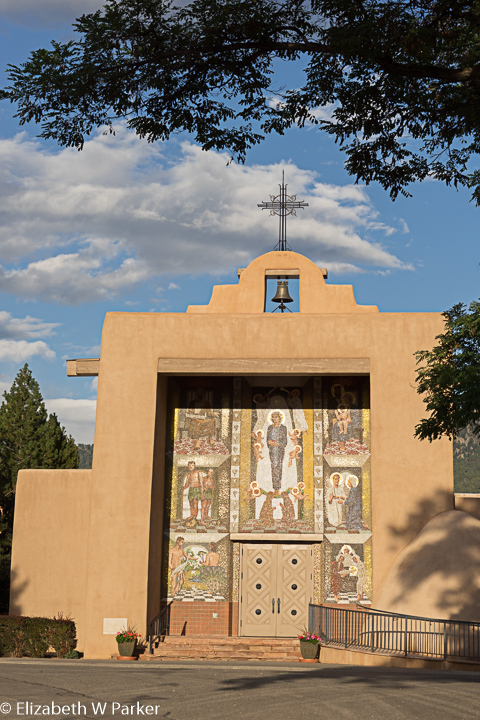 Following the gallery experience we continued to do some sightseeing, visiting the Palace of the Governors, outside only; the St. Francis of Assisi Cathedral Basilica, inside and out; the Loretto Chapel, inside and out; and the San Miguel Mission, inside and out. 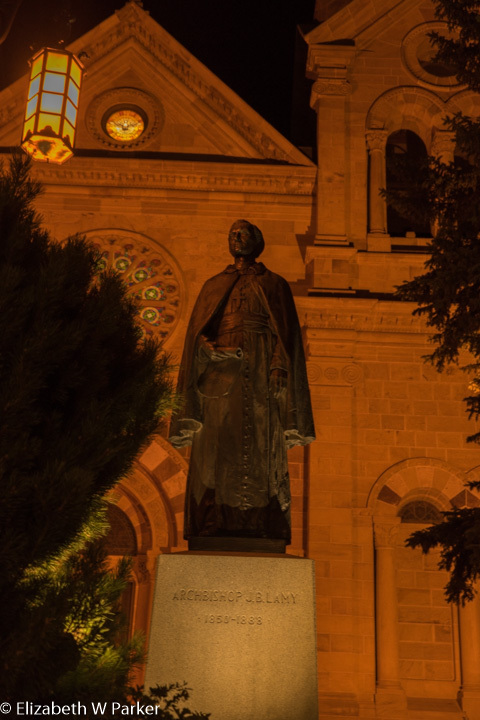 Archbishop Lamy (Latour in the book) in front of his “French” cathedral. Spanish tapas restaurant frequented by mostly locals. It was, as a result, much quieter and less hectic, and we enjoyed a slow, relaxing dinner. The festival in the plaza was on again tonight so after dinner we strolled over and listened to the last couple of songs before the event ended. From the plaza, we walked to the cathedral and took some night pictures. I really love to explore a town and take pictures at night. I see a place very differently when there are fewer people at work and more people at play. Day three we were free all day, too. There was a lot of discussion at the communal breakfast about the pros and cons of various destinations. The complication here is that all of us are participating in the “reunion” which starts tonight. During the reunion, we will get to go out and shoot in two places, but there are two other places we won’t. Add to that other places besides those on the reunion list… Decisions! Decisions! 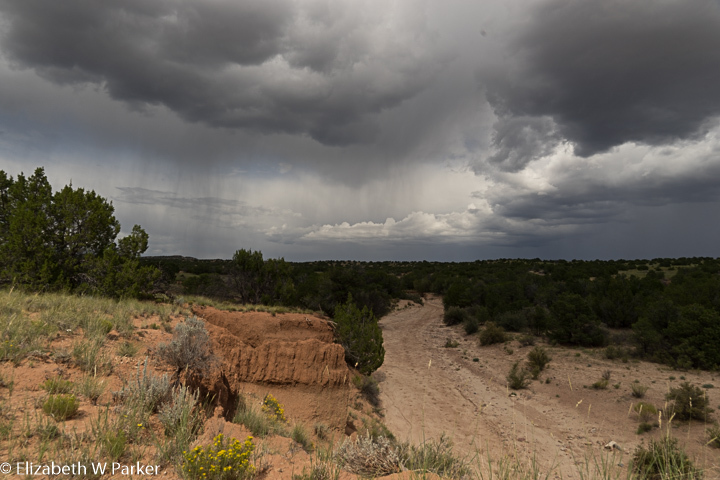 Well, rain was threatening so we decided against the Tent Rocks which are in a slot canyon and decided to go to Bandelier National Monument and the Valles Caldera. 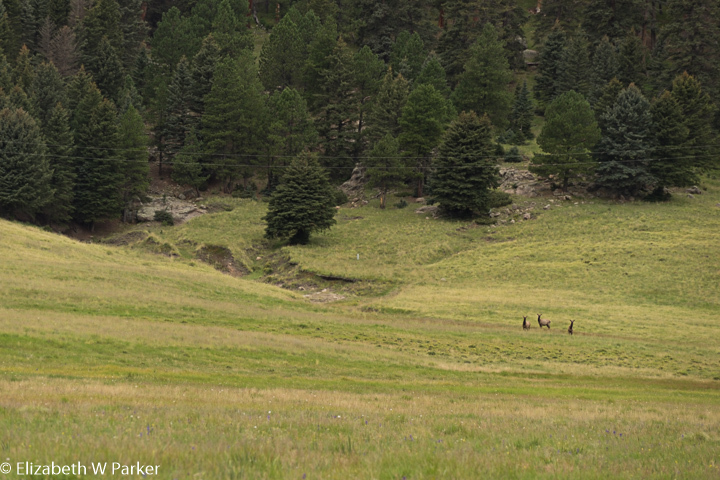 Both are northwest of Santa Fe – the drive to Bandelier is about an hour, Valles Caldera another 20 minutes from there. 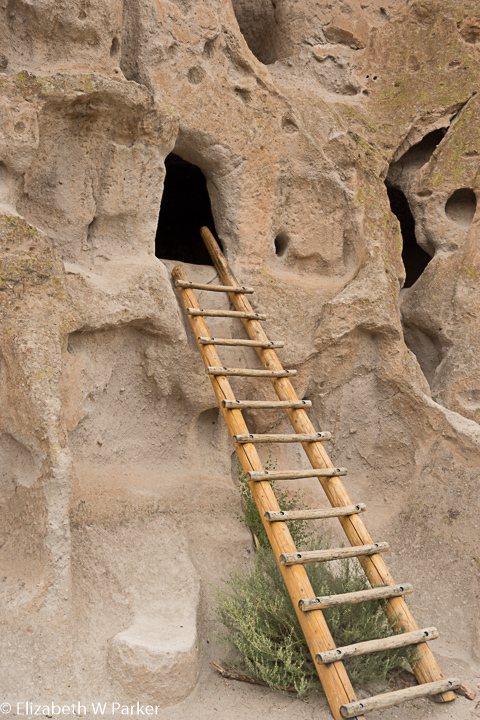 The Bandelier National Monument is named for Adolf Bandelier (1840-1914), an archeologist who did extensive field studies of the Pueblo people at Pecos, Santo Domingo and Cochiti Pueblos as well as in the Frijoles Canyon, now a part of the National Monument named in his honor. 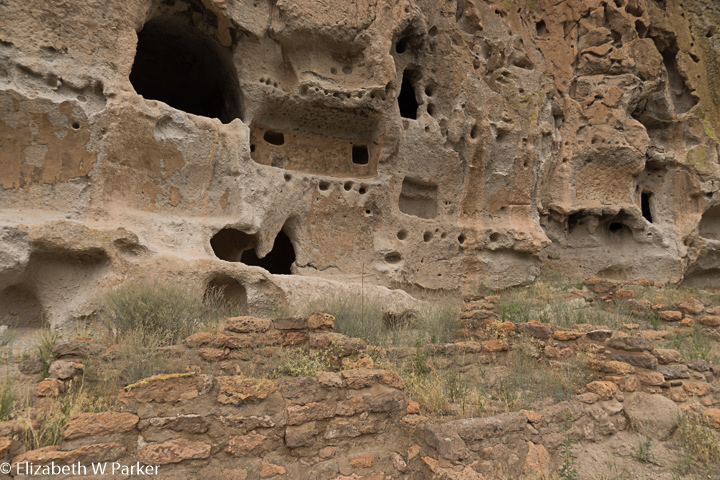 Bandelier is noteworthy because his work foreshadowed the modern interdisciplinary study of archeology, bringing in interviews with living people, and the study of the current culture as a window to understanding the past. For our visit, we stopped, as instructed, at the White Rock Visitors Center thinking to catch the shuttle from there. 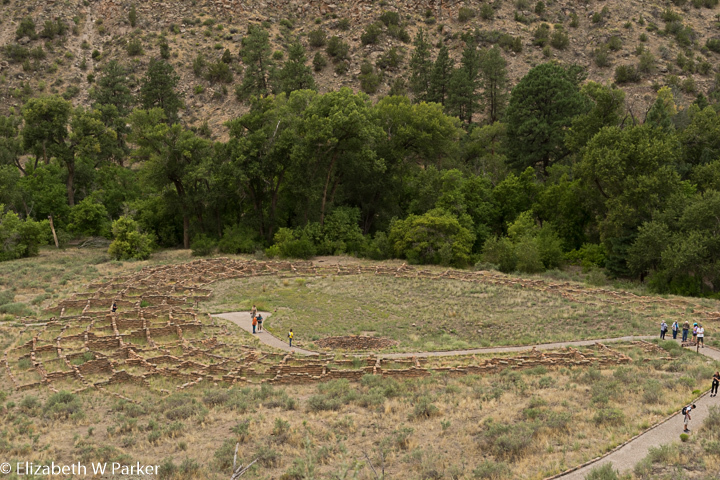 During the busy summer months, the only way into Bandelier is via this shuttle. However, a helpful volunteer at the visitors’ center explained to us that because we were continuing to Valles Caldera, we could actually drive into the Monument and park at the Juniper Campground. That way, once finished in the canyon, we could return to the campground and then continue on to Valles Caldera…Otherwise we would have to retrace the same stretch on Highway 4 four times! It worked like a dream! We told the ranger at the entrance to the Monument (I got us in with my National Parks Senior Card!) we would continue on and she waved us through. 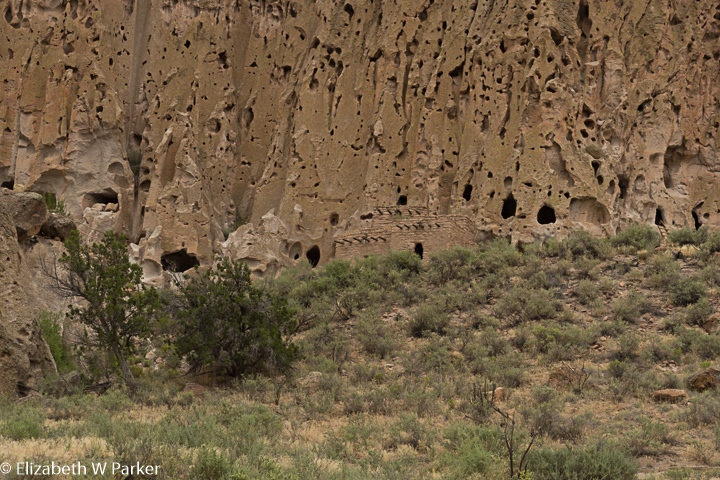 Bandelier National Monument – Remains of cliff houses. Notice where there is a line of holes…these were for roof supports. The shuttle from White Rocks makes an intermediate stop at the Juniper Campground, so it was there that we hopped on. We had an interesting chat with another visitor waiting for the shuttle. He was an archeologist who had been previously employed by the Los Alamos National Laboratory, a property that abuts the Bandelier Monument along one entire side and then some. He talked to us about the ancient Puebloans that lived in the canyon we are going to see, as well as the rock and its origins. On the shuttle, we met up with friends from the workshop and so walked the property together. The site is an ancient city, both on the ground and in the cliffs. There was a self-guided walking tour. It was too much to read as you walked, but you needed to skim the text to make sure you didn’t miss things along the way. We saw the excavation of the houses around the large central plaza – just low walls are left. There was also one fully excavated and “stabilized” kiva in the plaza, one of three. A large kiva stands outside this main area. Above the plaza, along the cliffs are the ruins of the cliff houses. The Monument has outfitted some of the larger caves with ladders so that you can go up and experience the rooms. The city extends for quite a distance along the cliff’s side. Besides the dwelling rooms, you can see places where roof/floor beams went into the cliff where the dwellings were several stories high. There were also rock carvings and paintings. The route eventually forks and you can continue another ½ mile to see a lookout. But, it was already raining as we were walking along the cliff so we just took the “nature walk” back to the Visitor’s Center. Our walk was no more than 2 miles total. There is some up and down, but it is easy enough. “They” say that the walk to the house at the lookout involves a climb of 140 feet by ladder and steps … that was another reason we rejected it. 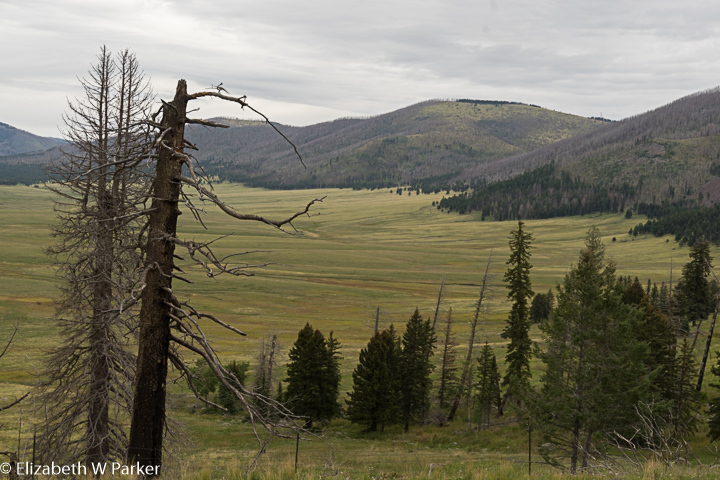 Gerry had lunch at the gift shop – a hotdog and green chili fries – and then we returned to the car via the shuttle and drove further westward to the Valles Caldera, also referred to as Valle Grande. 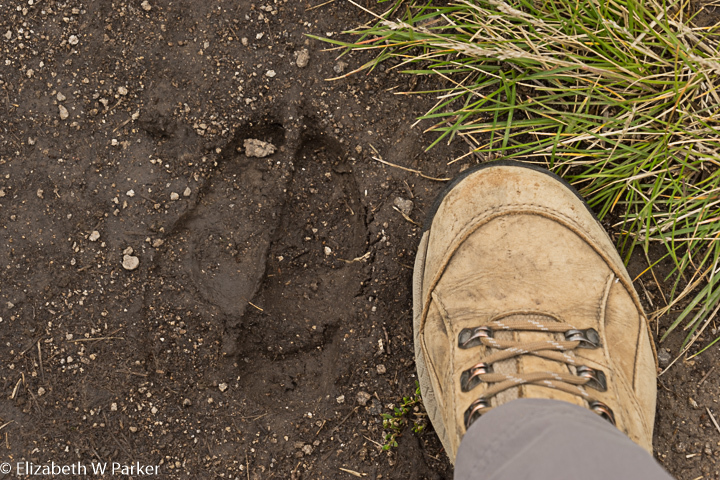 Valles Caldera – an elk print compared to the toe of my hiking boots. Turning off Hwy 4, the drive to the visitor’s center is about 2 miles. The road curves slightly downward and then snakes out to the “island,” a dome made by later lava being forced up to the surface. It was already late in the afternoon, so the ranger on duty (just about the only person we met in our entire 10 days in NM who wasn’t very nice) told us to walk around the dome, a trip of about 1.25 miles that would be about perfect for the time we had. She said we might see elk, or maybe badgers. That was enough to recommend me! We saw so many wild flowers! We also saw prairie dogs, and yes! 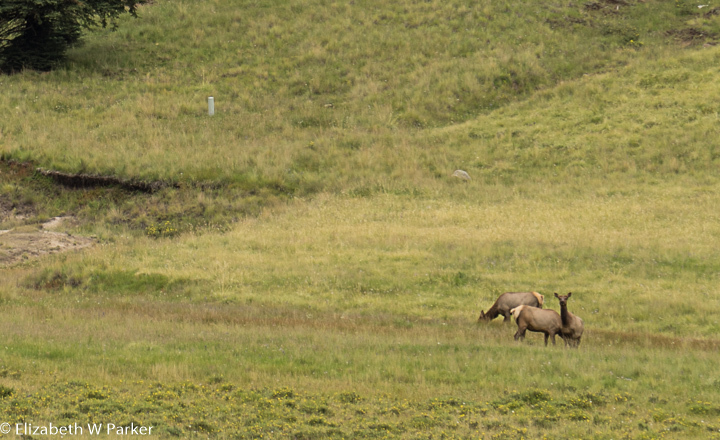 Elk, too! It was very damp. Not just from the misty rain that was falling, but a genuinely damp place, air and ground both. It wasn’t warm either…Reading up on the caldera I learned that the rainy months are July and August. Those are also the warmest months – but the temperatures still average in the 50s. It was a beautiful walk. There are many other things to do and see in this large park. We will have to return. Leaving the park, we were in a bit of a rush to get back to Santa Fe for our social event at 6. The drive was just about 1 ½ hours. As we left the park we saw some great looking birds! They even posed for us! The “shortcut” back took us through the town of Los Alamos, where the Los Alamos Natonal Laboratory is. (This is where the atomic bombs of the Manhattan Project were built …) Before we could enter the town, we were stopped for a security check! A pleasant faced-young man with a smile asked to see Gerry’s driver’s license and informed us to take no pictures. It was an odd feeling. That evening we had our orientation and welcome reception, and then dinner with the other 56 participants in the reunion. Friday and Saturday mornings we were treated to talks by photographer friends of Eddie’s. Each had something a little different to tell us, and a slightly different challenge to toss out. It was extremely valuable, but perhaps not the material for a travel blog. Both afternoons, after lunch we went out to shoot in small groups, taking advantage of the amazing landscapes around us. 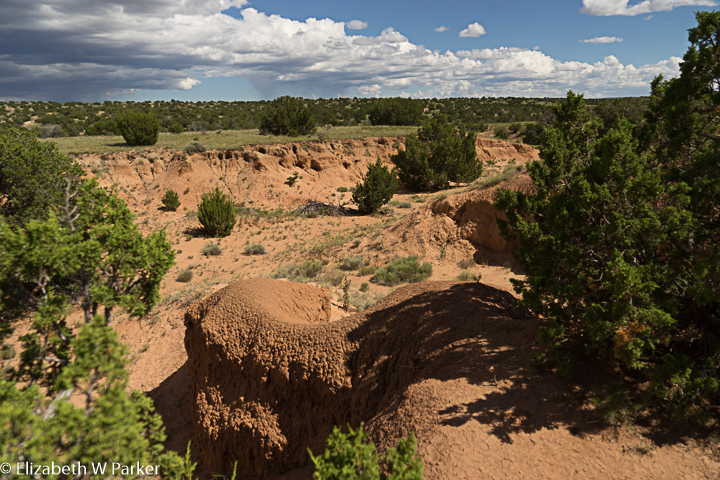 Friday afternoon, we were assigned to shoot in Galisteo Basin Preserve, a locale just 15 minutes from Santa Fe. A rolling landscape of arroyos, the dominant trees were piñon and juniper. We were fully immersed in the topography we had observed on the way from Albuquerque to Santa Fe. This “basin” refers to a large watershed area south of the Sangre de Cristo Mountains. It is supposed to teem with wildlife, but beyond a couple of bunnies, we saw none. It was hot, though! The best part was seeing two rainbows. The second one was the traditional arc shape, but the first one was horizontal! It was amazing to see it forming, to watch how the phenomenon changed colors as it added the blue and purple to the initial yellow and green. We had dinner with our shooting group, then returned to the Center for social hour and bed. 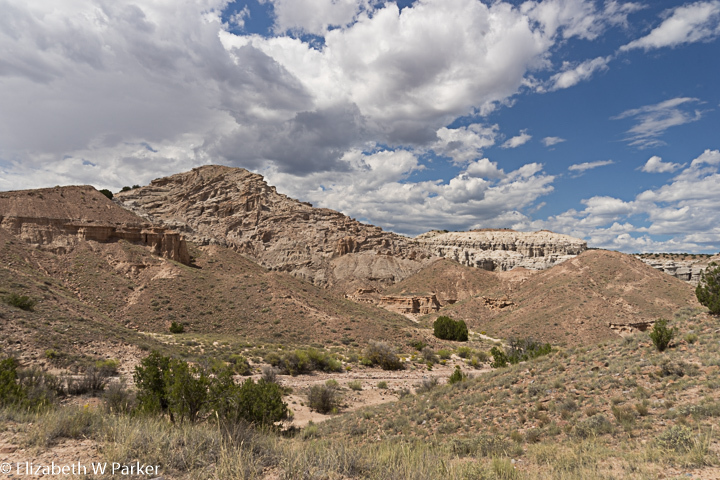 Plaza Blanca – view from the road. Saturday afternoon we went to Plaza Blanca. It was fabulous! It is hard to describe the feeling of awe that I had here. 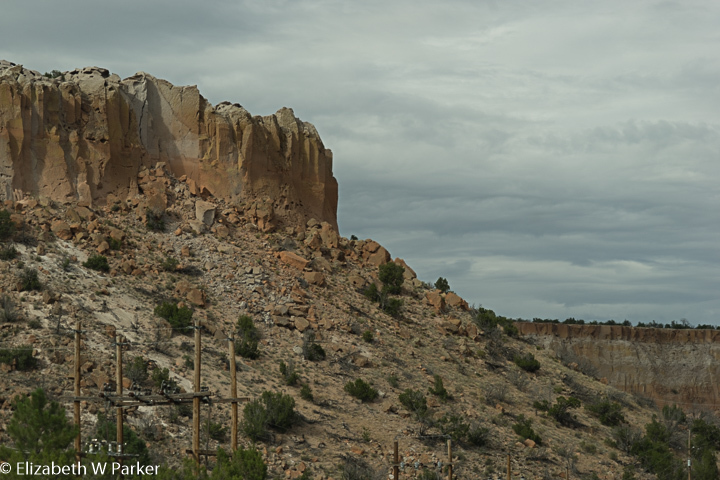 The drive to Plaza Blanca is the same drive to get to Ghost Ranch and Albiquiu (neither of which we got to see on this trip). As you’re driving along, all of a sudden there is a window into a landscape totally unlike what you’re are driving in! You can see these immense and tall rocks that appear snow white. I love rocks! I hopped out of the van and hurried to get on the trail. Georgia O’Keeffe painted here; Shirley McClain is sure it is a place of healing. Its magic will draw you in. The white limestone towers above you, carved and sculpted by wind and water. It is a fantasy landscape – I felt like I was looking at the ruins of Abu Simbel centuries in the future. There just aren’t enough suitable words to tell you what this place was like. And, it was very large. Corrina, one of our fellow reunioners, was familiar with the place and she guided us through the essential formations. Our walk was between 3-4 miles. The place is located on the private property of Dar al Islam, a not-for-profit education center for understanding Islam. We did not see the center itself, but be aware that you need permission from it to walk on the land and take pictures. Tonight, we had a group dinner with presentations by Reid Callanan, the head of the Santa Fe Photographic Workshops and Eddie. There was also a photo exchange, but we did not participate. The trip continues with lots more words and pictures. Just click here to keep reading.